The men have always been infatuated with having a big muscular chest. Ever wonder why, women have a crush on the guys having well-formed chest? Well-formed chest have always been associated with strength, endurance and power. If you want to hop on the bandwagon of big chest gang, you have come to the right place. We have worked out a routine, which is put together just for you guys who wish to have their pectorals appear as if they were chiseled out of stone. This multi-faceted 45 minutes chest workout is designed to target all the four areas of the chest: Upper, Middle, Side and Lower. Chiseling your workout down to “single body part sessions on a day” is an ideal technique of training for those individuals who want to maximize conditioning, strength and size gains for all their body parts in a balanced way. We recommend that you focus on one part-one day technique and cover your all parts in a week – one by one. But the professionals such as bodybuilders, power-lifters and athletes who have advanced training and experience — generally do their training incorporating two or more different body parts per day. For instance, a chest routine in the morning, and a back routine in the afternoon or evening. Many experts claim that a 45-minute training program is an ideal work-out format for muscles growth and development. That’s because research shows your body goes in to a “building state” after a 40-45 minute session. – meaning it is at it’s strongest during that time. Any additional time added or infused into the program sets your body in a state known as “recovery mode” because of fatigue. Furthermore, this is the phase during which most injuries occur. That’s why I personally love 45-minute workout for its combination of all aspects to give me width, depth, strength, endurance, and power all in one! I have taken up the task of designing a series of 45-minute workouts. The first one I did on 45-minute biceps workout. Here is a specially designed 45-minute program to workout chest muscles, which includes 5 top chest exercises to add mass and chisel out well-formed big chest. Give it a try and see how it works for you. During this workout you will target the upper pecs, as well as the middle, lower, inner, and outer pec fibers for an all-around chest blast. Instructions: First warm up completely, and then carry out 3-4 sets of the following exercises, 10 -15 repetitions each, with 90-120 seconds of rest in between the sets. Increase weight by 5 or 10 lbs in each subsequent set. To get best results, let your chest rest for at least 2 days before re-training. 1. Incline Barbell Presses: The incline barbell bench press is a great way to add variety to your pressing routine and to hit muscle groups from different angles leading to new growth. (i) Load the bar with an appropriate weight for your work out. (ii) Position your body on an incline bench machine with your feet flat on the ground. Your back should be arched and shoulder blades retracted. Tip: Adjust to an incline of 15-30 degrees because this will put optimal stress on the upper pec while keeping the recruitment of the front delts to a minimum. (iii) With arms slightly wider than shoulder width apart, grasp the barbell with pronated grip. 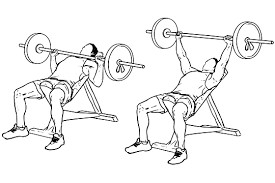 Remove the bar from the rack, holding the weight above your chest with your arms extended. This will be your starting position. 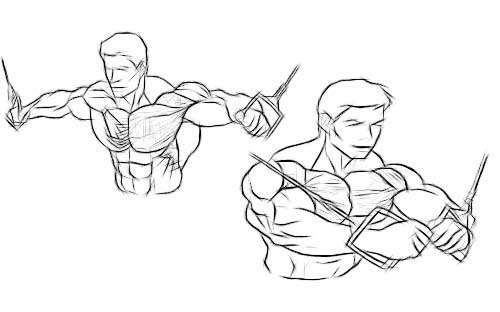 (iv) Slowly lower the bar to the sternum / your upper chest by flexing the elbows. Your lats should stay tight and elbows slightly drawn in. (v) Let the bar just touch your torso, rest for a count of 1 second, and then lift the barbell to the starting position extending the elbows. (vi) Repeat the movement for the recommended number of repetitions. Caution: Don’t bounce the weight off your chest. You should remain in full control of the barbell at all times. Number of Sets: 3-4; Reps: 10-15. 2. Dumbbell Chest Presses: The Dumbbell Bench Press is a great chest exercise because it can be performed using various angles to develop every part of the chest muscle. 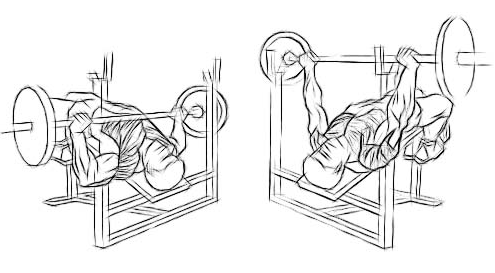 The Dumbbell Bench Press is also a fantastic chest exercise because it allows for great freedom of motion and as such engages many supporting muscles that further stimulate optimal chest development. (i) Lie down on a flat bench with a dumbbell in each hand resting on top of your thighs. The palms of your hands will be facing each other. Keep your head, shoulders and lower back on the bench. Feet must be flat on the ground. (ii) Using your thighs to help raise the dumbbells up, lift the dumbbells and hold them in front of you at shoulder width. (iii) Once at shoulder width, rotate your wrists forward so that the palms of your hands are facing away from you. The dumbbells should be just to the sides of your chest, with your upper arm and forearm making a 90-degree angle. Make sure to maintain full control of the dumbbells at all times. This will be your starting position. (iv) Then, as you breathe out, use your chest to push the dumbbells upward until your arms are fully extended to natural position. While squeezing your chest, hold for a count of 1 second and then slowly lower the dumbbells to the starting position. (v) Repeat the movement for the recommended number of repetitions. Tip: For best results, lowering the weight should take about twice as long as raising it. Variation: A variation of this exercise is to perform it with the palms of the hands facing each other. 3. Cable Machine Crossover: Most strength training exercises for the chest involve lying on a bench, but the cable crossover forces you to do the exercise from a standing position. This means your legs and core have to contribute in order to keep you on balance. The cable crossover primarily develops the major muscle in your chest, which is called the pectoralis major. The pectoralis major originates at your sternum and then shoots out to each of your shoulders where it inserts at the very top of your upper arm bone. (i) Place the pulleys at the desired height level, choose the resistance to be used and hold the pulleys in each hand. (ii) Standing in the middle of the machine, step forward in front of an imaginary straight line between both the pulleys. Your torso should have a small forward bend from the waist. This will be your starting position. (iii) Begin by keeping your head looking forward, with a slight bend on your elbows in order to prevent stress at the biceps tendon, slowly bring your arms and hands forward in a wide arc until they slightly touch in the middle of your body and you feel a stretch on your chest. Breathe in as you perform this portion of the movement. Hold the position for 1 second and then slowly return your arms back to the starting position as you breathe out. Make sure to use the same arc of motion while returning back. (iv) Repeat the movement for the recommended number of repetitions. Tip: Keep in mind that throughout the movement, the arms and torso should remain stationary; the movement should only occur at the shoulder joint. (i) Setting the pulleys in the highest position focuses on the lower pecs, while the lowest position will work your upper pecs. Placing the pulleys at shoulder height—with arms parallel to the floor—will target your middle pec fibers. (ii) You can also vary the point in front of you where your arms meet. 4. Chest Dips: Chest dips are a powerful exercise for building a muscular chest. They also work your entire upper body including your back, arms and shoulders. (i) Begin by lifting your body on top of a dip machine or parallel bars. To get yourself into the starting position, hold your body at arms length (arms locked) above the bars. (ii) While breathing in, slowly lower your body with your torso leaning forward around 30 degrees or so and your elbows flared out slightly until you feel a slight stretch in the chest. (iii) Once you feel the stretch, use your chest to bring your body back to the starting position as you breathe out. Tips: Remember to squeeze the chest at the top of the movement for a second. More advanced lifters can add weight to the exercise by using a weight belt that allows the addition of weighted plates. 5. Decline Barbell Chest Presses: If you want to add a lot of new size and strength to your upper torso, you need to do the decline barbell bench press. (i) Begin by securing your feet under the padding provided at the end of the decline bench and then slowly lay down on the bench with head and back flat on the bench. (ii) Using a medium width grip (a grip that creates a 90-degree angle in the middle of the movement between the forearms and the upper arms), lift the barbell from the rack and hold it straight over you with your arms locked. The arms should be perpendicular to the floor. This will be your starting position. (iii) As you breathe in, slowly lower until you feel the bar on your lower chest (bottom of your chest) and hold for a count of 1 second. After a second pause, lift the barbell back to the starting position as you breathe out and push the bar using your chest muscles. Lock your arms and squeeze your chest in the contracted position, hold for a second and then start coming down slowly again. Tip: The ideal is to take at least twice as long to go down than to come up. (v) When you are done, place the bar back in the rack. (i) Don’t let the bar drift too far forward. You want the bar to touch your lower chest and nowhere else. (ii) You should maintain full control on the barbell at all times. Don’t bounce the weight off your chest. Variations: You can also use dumbbells to perform this exercise. It’s recommended not to include all of these exercises in each and every workout you do, but by interchanging them from training to training with some of other best chest muscles building exercises from here, you can maintain the stimulus high and also not allow your muscles to get adapted. Such constant change in your chest workout plan is what needed to avert a plateau and helps push your strength levels to new extremes, so do make sure you are making use of a good variety. A lot of people are curious about how they look. Most of them wants to have a great looking body. I am sure this information will help them a lot. Great idea for sharing!